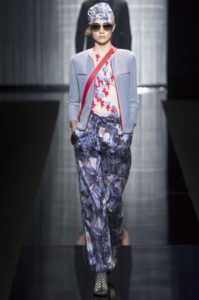 The Giorgio Armani spring summer ready to wear 2017 collection was shown last September in Milan during fashion month. The collection was titled 'charmani' with a play on the word charm mixed with the brands name. "THE ELEGANCE THAT MAKES AN IMPRESSION AND IS REMEMBERED, NOT JUST SEEN. 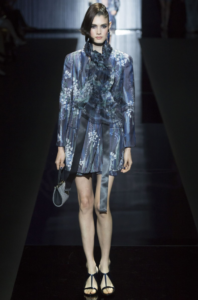 GIORGIO ARMANI REVISITS HIS MOST ICONIC SILHOUETTE AND ADDS UNEXPECTED TOUCHES TO THE GIORGIO ARMANI SPRING/SUMMER 2017 RESORT COLLECTION." - Armani 2016. 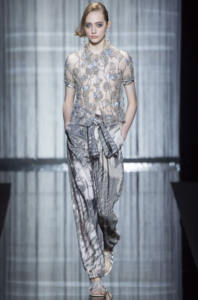 The collection featured many flowing silk dresses. 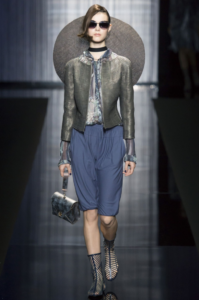 The color palette was mostly blues, with greys and muted neutrals. However there was the occasional flash of playful red to add a sharp varying contrast to the rest of the collection. With a mix of daywear and evening wear including mini dresses, silk jackets and printed silk joggers, the collection has many oriental influences. 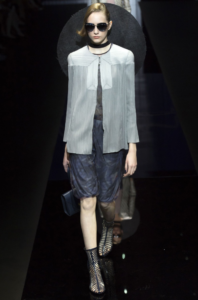 Scroll to view the Giorgio Armani collection below. 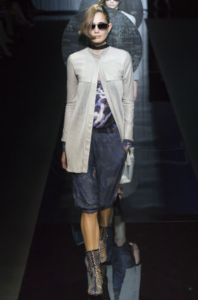 For the collection online visit Armani.com. For a list of stores and store locator, click here.